Beginning around 1960, Mantua's TYCO products started appearing in red colored packages. This Red Box Era for TYCO would last until the early 1970s and the sale of the TYCO name and line to Consolidated Foods. 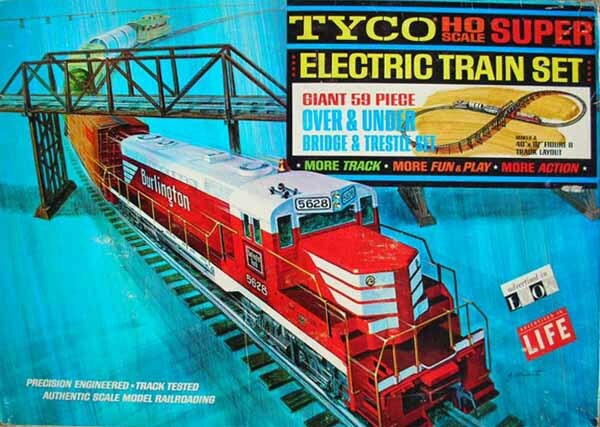 During the Red Box Era of the 1960s, TYCO would greatly expand its HO-scale train line and become a major player in the hobby market. It is during this period of TYCO's history that the familiar GP20 and Alco 430 join the line, plus the company's first Action Accessories arrive and much more. See it all at The TYCO Red Box Ho-Scale Trains Resource.